What's in your lunch box? Ok, I hope nobody's lunch is dangerous, and I wouldn't expect lunch to even be described as daring. But then I had a conversation with some friends over lunch at work. It began when one of them said that she had eaten a tuna salad sandwich for lunch every day from first through eighth grade. I didn't believe her. Nobody can be that picky, I said. Another friend had no problem accepting that the tuna-a-day habit was not an exaggeration, because she had eaten peanut butter and jelly every single day of grade school. Well, what did you take for lunch? they asked me. Ah, my school lunches. I had a plastic lunch box that looked like Snoopy's doghouse, and in it my mom often packed a sandwich, though certainly not the same thing every day. I liked ham, bologna, and I was a huge fan of pickle and pimento loaf. One of my favorites was corned beef and swiss cheese with mustard, on rye or pumpernickel bread. You ate pumpernickel bread in grade school? The only kind of bread we didn't eat was square white bread. I admit, I was embarrassed that my sandwiches didn't fit nicely into little baggies like my classmates' sandwiches did, but I appreciated the variety, like wheat, oatmeal, and Challah. And my mom used different cheeses, too. I particularly liked the one I called monster; I think I was ten before I found out it was muenster. Half the time, though, I didn't even get a sandwich. I had a wide-mouth thermos, and mom gave me soup, stew, macaroni and cheese, or spaghetti. Sometimes I had leftovers from a previous night's dinner. At this point, my friend started to laugh, and pointed to my lunch (leftovers). My lunches haven't changed much in over 30 years, though I no longer have a Snoopy lunch box. Some printable paper rulers - Inches and centimeters, of various types, including some without markings to see if you really understand the measurements you're using. Three printable protractors - Three kinds of markings, for three different types of measurement. A decimeter box - "The idea: Having a 10 cm cube helps you get to know how big millimeters and centimeters are. Here are pages you can print out, cut out, fold and tape, to make your own 10 centimeter box." More kinds of graph paper than you can shake a stick at - Wow. Seriously, wow. Thanks to Friedbeef Tech for these. Several years ago, I used to babysit my old roommate's son, Matt. He and I always got along well and I was happy to do so. One day, I was babysitting him and he had to contact his mom, so I showed him my telephone. It was an old, wall-mounted rotary dial telephone that had conveyed with my condo. As Matt was six or seven at the time, he had never seen a dial phone before and he looked at it as if it were ancient technology...which, of course, it was. Fortunately, my girlfriend was with us, and she let him borrow her cell phone, which he dialed as if he had been using one all his life. Which, of course, he had. It wasn't always like that. I'm sure you've seen the old movies/tv shows where someone holds an earpiece to their ear, turns a crank several times, and yells into the wall-mounted microphone, "Operator! Get me..." and they'd give a number...or probably a city, which would connect you to a party line and the fun would really start. In the 1920's, the phone company started to do away with the crank phones and introduced dial phones...but like Matt, no one knew how to use one. At midnight on Saturday, May 28, 1927, the city of Fresno was converting to dial telephones, so the phone company released this public service announcement to the local theaters, to teach people how to use that brand-new piece of equipment...the dial telephone. As a kid, the absolute best gift I could receive was a book. I was a bookworm for sure, but early on I also recognized the power of a good reference book. I still have most of those books today, still in excellent condition, and I still reread them occasionally. My uncle Art always surprised and delighted us with books. We used to visit him and his "library", which was a good sized bookcase full of interesting titles. He even owned a copy of an unabridged baseball encyclopedia, which listed the complete known statistics of every player ever to play in the major leagues. I spent hours looking up my favorite current players and reading about the legends of the game, following up on interesting details that caught my fancy. What inspired this particular post is an old friend that I've recently picked up again, the Moon Flight Atlas. Written for pre-teens, it's full of wonderful pictures and diagrams describing a wide range of topics related to mankind's efforts to reach the moon and Mars beyond. It was published soon after Apollo 11 landed on the moon, and the enthusiasm and optimism towards the future of man in space is sad when viewed in hindsight. Still, this book and many others fired my imagination and interests in science, interests that continue to this day. The inscription on the inside front cover reads: "To Ted, from Uncle Art - Christmas, 1969". Thanks, Uncle Art. Thank you. Construction on the Chesapeake & Ohio Canal began in 1828 in Washington, D.C., although the idea for a navigable waterway from the Potomac to the Ohio Valley was envisioned as early as George Washington's time. The 184.5 mile canal was completed in 1850, ending in Cumberland, Maryland, and for nearly 75 years it was a major route for moving coal (850,000 tons in 1871). Flooding was always an issue, however, and since the railroad had moved in by then, in 1924 the canal ceased operations following another flood. One who walked the canal its full length could plead that cause with the eloquence of a John Muir. He would get to know muskrats, badgers, and fox; he would hear the roar of wind in thickets; He would see strange islands and promontories through the fantasy of fog; he would discover the glory there is in the first flower of spring, the glory there is even in a blade of grass; the whistling wings of ducks would make silence have new values for him. Certain it is that he could never acquire that understanding going 60, or even 25, miles an hour. By the time he was ten miles from the city, Douglas had 50 followers, and was being paralleled in the canal by canoeists bearing such signs as SAVE THE CANAL and LESS CARS-MORE CANOES ! The long walk ended at an old canal lock a quarter of a mile farther along. A National Park Service sightseeing barge, drawn by two mules, awaited the hikers. They climbed aboard to ride the last five miles to Georgetown. Their triumphal entry into the city, however, was just beginning. As the barge sloshed down the canal, hundreds of men, women & children hustled along the banks exchanging greetings with the expedition. Other well-wishers called greetings from overhead bridges. The escorting fleet of canoes grew. Automobiles jammed up along a parallel roadway. The 12,000 acres, including the canal and towpath rather than a paved road, became a national park in 1971. This may be a reproduction, or perhaps a replacement, lockhouse. On the other side of the canal you can see the stone foundation of another building. The canal at Lock 26. If you like the book, "The Dangerous Book for Boys" (Conn Iggulden, Hal Iggulden), and I assume you might since you're here on the Dangerous and Daring Blog for Boys and Girls, there are two other books you might want to check out. The Boys Book: How To Be The Best At Everything. How to do almost anything in one handy book. Found yourself in a sticky situation? Inside you'll learn how to escape quicksand (p. 40), build a raft (p.41), start a survival fire (p.99), or fly a helicopter (p. 11). Want to impress your friends? Now you can rip a phonebook in half (p. 35), hypnotize a chicken (p. 56), or read their minds (p. 73). Boring Saturday afternoon? Not anymore when you find out how to make a waterbomb (p. 79), a boomerang (p. 95), or a volcano (p. 88). And loads of other keen things you need to know how to do! How to do almost anything in one handy little book! Want to be known for your unique style? Inside you'll learn how to design your own clothes (p. 35), do the perfect manicure (p. 82), or make your own lip gloss (p. 11). Feel like impressing your friends? Show them how you can make a crystal (p. 16), juggle one-handed (p. 33), or deal with a bully (p. 42). Bored and need something to do? Not anymore when you find out how to keep a secret diary (p. 88), make a scrapbook (p. 9), or put together a dance routine (p. 24). And tons of other neat-o things you need to know how to do! Of course by telling you about these books I may have just deprived myself and all the other contributers here a wealth of post topics! Sorry everyone. Some of the problems with pursuing modern science at home - or in a school - (particularly electronics or the study of matter at the atomic scale) is that the equipment to be able to see the effects of that scale can cost so much! 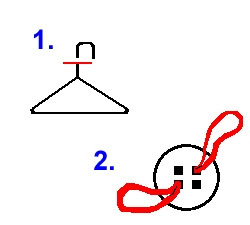 Well, here are instructions on making two pieces of equipment used in modern science. The oscilloscope is still one of the most important measurement tools of the electronic engineer. With the advent of the often very reasonably priced USB scopes, such an instrument is now within reach of every body. The goal of this project is to build a simple STM that can resolve atoms, with a cost of materials less than $100.00 excluding oscilloscope. My real goal here is to provide a base of information so experimenters and students could build a simple STM. Typical piezo tubes used in tube scanners of commercial scanning probe microscopes cost in the range of $200 - $800 and operate with several hundred volts applied to the scanner. This design uses a unimorph disk scanner to reduce the cost and avoid using any high voltage. The Piezo element is commonly available and this particular one costs $1.80. The control voltages are so low that two 9-volt batteries can power the control electronics. As kids, we used to make these as needed every summer, although occasionally someone would fashion a more elaborate one and keep it from year to year. And no, none of us ever put an eye out with one of these. Then again, we were bright enough not to intentionally aim at the face. We also did a lot of target shooting with 'em. That's what I recommend: target shooting at cans or flies or plastic army men. Wood - length of broomstick or dowel, or a 1"x2" or even a 2"x4". Whatever you use, you need a piece about 12" long (more for a 2"x4" rifle). Clothespins - tradition says to use the wooden spring type, but the plastic ones will work just fine. The simplest gun uses one, we usually used at least two. They come in bags of 100 or more, so borrow from a neighbor if you don't have your own. Or make lots of guns, you politically incorrect brute. Rubberbands - in our house, we kept rubberbands around the doorknob on the furnace closet, and had plenty because you got one with every newspaper delivered. They're cheap, so don't go mugging the paperboy for his. Take sandpaper and round off any sharp edges to eliminate wood splinters. Use a file to cut a shallow "V" notch in the end of the wood. Use one rubber band to fasten a clothespin to the wood on the opposite end of the wood from the notch. That's it! Here's a picture of a fancy store-bought model that works exactly this way. It's a good view of the clothespin and notch setup. Hook a rubber band around the end of the wood so it's in the notch. Stretch it back with one hand, use the other to open the clothespin and catch the rubberband. When ready to shoot, press on the clothespin and zing! You can cut out pistol or rifle shapes from the wood, mount multiple clothespins (and make extra notches), and do all kinds of custom coolness with the basic design. Often we'd grab a piece of scrap wood, use a rock to gouge out the notch, grab a clothespin from the clothesline out back and a handfull of rubberbands from the doorknob. Within minutes you had something that worked, and sometimes the ugliest thing was the straightest shooter (my best was a piece of old yellow broomstick with two clothespins attached). Showing up with a store-bought rubberband gun was tolerated - barely - mainly because we'd closely examine it to see how they managed multiple shots if it worked that way. Bernard Smith was born in 1910 in New York City. By age 22, he had dropped out of high school, working odd jobs and spending most of his time at the libraries and museums of the city. One night, he attended a meeting of the American Rocket Society and while looking over one of their failed rockets, made some suggestions on how to improve the device. The president of the Society, Edward Pendray, handed him the pieces of the rocket and invited him to create the next version. According to Smith, his motivation was simple. America was in the midst of the Great Depression, and "It was a lousy planet. The rocket ship was the only way to get off it." After making major modifications to the original rocket design, including several weight-saving changes, the new rocket was ready to fly in early 1933. It wasn't entirely successful, but proved that the basic concepts were sound. Bernard Smith never did graduate from high school, but he did earn a degree in Physics. In fact, after World War II he started his career working for the US Navy, eventually heading up the Weapons Development Department at the Naval Ordinance Test Station. Among the projects that he worked on or managed are the ASROC, Sidewinder and Shrike. He also spearheaded Project Pilot, which placed at least one small satellite into orbit via air-launched rockets in 1958. So that's the "rocket" side of Bernard Smith. But there's more, for there's the "sailboat" side of Bernard Smith. Smith also spent over 40 years pursuing his dream of creating the perfect sailboat. He tried many unconventional designs and met some notable successes. In fact, one of his early efforts, the Aerohydrofoil, could make 20 knots in a 12 knot wind. He also designed craft he called Monomarans, Fliptackers, and experimented with a concept called the Sailloon, which was a gas-filled sail that would help provide lift, and thus speed, to a sailboat. Follow that link above for a fascinating look at the creations of a mind who saw radically different, and sometimes better, ways to accomplish his goals, both through the air and on the water. You can learn a lot about people by looking at the symbols they use to represent themselves. About 2 million people call the country of Bhutan home. Over 90% of these people make their livings with agricultural pursuits. Bhutan is a constitutional monarchy located between India and China. Around 75% of Bhutan's residents are Buddhists, and the rest are Hindus. Religion is very important in Bhutan, and that is reflected in the nation's flag. Half of the flag is orange to symbolize the Buddhist religion. (After all, when you think of a Buddhist monk, isn't he usually wearing orange robes?) The other half of the flag is yellow to represent the fruit of the king's leadership. The dragon has a snarling mouth to indicate the strength of Bhutan's protective gods, and the jewels the dragon clutches symbolize the riches and perfection of the nation. The dragon is the color white to represent purity and loyalty, and the dragon as a whole represents Bhutan as a whole. Bhutan's name in the local language means "land of the dragon", which is at least partly named for the thunderstorms that form over the Himalayan Mountains to the north. The thunder produced by those storms is said to be the dragon's roar. This weekend is a treat for skywatchers and amateur astronomers. The annual Perseid meteor shower should be beautiful because it arrives while a new moon is in the sky. As many as 60 meteors per hour may be visible, with larger ones leaving a streak across the night sky as they burn up in our atmosphere. As a bonus, the planet Mars will be visible as a bright red dot in the sky to the northeast. Unlike most astronomical events, meteor watching is done best without telescope or binoculars. Get comfortable, pick out a patch of black sky away from light pollution, and watch patiently. The closer towards dawn, the more meteors you might see. The peak number should be Sunday night into Monday morning, but they'll be visible for several nights afterwards too. Every August at this time the Perseid shower occurs. Named for the constellation Perseus - because that's where the meteors appear to come from - their real origin is the comet Swift-Tuttle. When Earth crosses the path of the comet, debris from the comet's passing enters our atmosphere and gives us a light show. A very excellent website where Popular Science is taking its HOW 2.0 projects and turning them into quick 5 minute videos. Up right now are a use for old, died out hard drives, how to make a coffee can cellphone antenna, and making a bottle cap tripod. Have you ever stood outside on a cold, clear night, looking at the stars? If you can get out into the country, away from city lights, you can see thousands of stars...and once in a while, the quick streak of a meteor. There's no denying the beauty of the night skies. When you look at the stars, you are looking at the last, greatest unexplored frontier, a frontier into which Mankind has taken its most halting baby steps. Moon landings and probes sent skittering through the solar system, out into the Oort Cloud...and in a few hundred years, who knows where we will have traveled to? Men and women have been gazing at the stars since time began. There are those who misguidedly believe that the stars influence our lives: these are the kind of people who take horoscopes seriously and who really care whether you're a Libra or a Sagittarius. Where I come from, we call them "nuts." But anyone with a speck of imagination will look at the skies and see the ghostly patterns formed by the stars. These patterns - constellations - all have names, names that are unique to each human culture. And now you can look at the skies and see all of those constellations and planets without leaving your house. 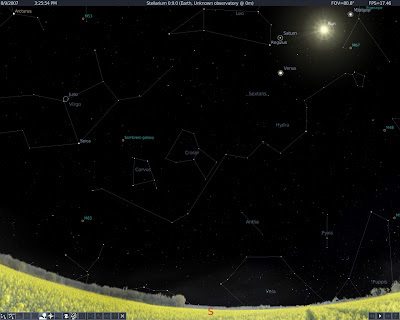 Check out Stellarium, a wonderful open-source computer program that turns your computer into a planetarium! You can download it at no charge: just click on the link. Once you've downloaded and installed the program (ask your parents for permission first, before installing any software), it will show the skies in real time. All you have to do is tell it where you are, and it will display the a picture of the sky, day or night. Just drag with your mouse to look in any direction...and you can zoom in to look at planets and nebulae more closely. Click on any star, planet, or galaxy, and detailed information will appear at the top left corner of your screen. Thanks to Joan of Argghh! for the link! A teenage girl was left home alone for the weekend by her parents. She was very responsible and didn't have any friends over. She just made herself dinner and went upstairs to her room to read before bedtime. She read for a little while with her dog lying on the floor beside the bed, then she turned out the light and went to sleep. In the middle of the night, the girl woke up because of a strange noise. She listened to the still darkness all around her, unable to figure out what had disturbed her. Then she faintly heard something from the bathroom...drip...drop...drip...drop. "There must be a leak," she thought to herself. She felt a little nervous in the house all alone. It was so dark and quiet. She put her hand down to feel for her dog. He licked her hand, and feeling safe, she fell back asleep. In the morning, the girl got up and went into the bathroom. There, her dog was hanging from the shower rod with his throat slit. His blood was slowly dripping onto the tile floor...drip...drop...drip...drop. Written on the mirror in blood was the message: "Aren't you glad you didn't look under the bed?" If you have a ghost/scary story you'd like to contribute, please e-mail it to jenlarson@gmail.com. Modern digital photography has made taking pictures a simple affair. Press a button, and BINGO! You can look on the display screen and see exactly what your picture looks like. In the Olden Days of film cameras, you had to wait three days to get your pictures back from the drugstore, only to find that you left your lenscap on for half of 'em, two of them have your Aunt Betty's head chopped in half, and your pinkie finger covered half the lens when you took that shot of Rover on the skateboard in the supermarket parking lot. Now, with a digital camera, you can see all those lousy pictures right away. Joy! But there were advantages to using those old-school film cameras. One of them was that you could develop your own pictures. Not all that hard if you took black-and-white pictures...definitely a challenge if you took color pictures. And there was nothing quite as exciting as watching your pictures appear as if by magic as you put the paper in the developing tray. You can do all this today - and you don't even need to buy a camera. Because all you really need is a few simple, easily available supplies (like an empty oatmeal canister, a used aluminum soda can, and some flat black spray paint) and you can take and develop your own pictures using a pinhole camera that you build yourself! It might seem surprising, but if light passes through a small enough hole, it gets refracted (bent) just as though it had gone through a lens! In fact, the very first cameras - long before photography was invented - were darkened rooms with a small opening. Light would come in through this tiny hole, and an upside-down image would be projected on the opposite wall of the room. The room was called a camera obscura, which simply means "dark room" in Latin - and that's where our modern word "camera" came from. It was easy enough for people to figure out that a camera obscura didn't have to be as big as a whole room. You could build one in a box, and if you put a sheet of frosted glass on the side opposite the little hole, you could see the image on the glass. Finally, in 1826, the French inventor Nicéphore Niépce figured out how to capture the image permanently, using chemicals. It wasn't easy, though - the first permanent photograph took eight hours to shoot! Modern cameras use film - or an electronic sensor in the case of digital cameras - to capture images. And they use lenses instead of pinholes...mainly because lenses let a lot more light through, so exposures can be tiny fractions of a second instead of many minutes. But pinhole cameras can still be used to capture beautiful images, and you don't need any fancy equipment to build one. Rather than "reinvent the wheel," I've found an excellent Web resource that gives complete, step-by-step instructions for building your own pinhole camera, taking pictures, and developing them yourself. You can find it here at Stew Woodruff's Oatmeal Box Pinhole Photography website. Whether you take your own pinhole photographs, or whether you just browse the gallery at the Oatmeal Box Pinhole Photography site, you'll notice that the photographs are all exceptionally sharp, and many of them have a "wide-angle" appearance. It's one of the things that make pinhole photos so unusual-looking. Try it! ...and your friends jump like crazy when a loud rattling sound buzzes from inside the envelope! When I was growing up, every few years I would make this simple practical joke and scare a brand new group of schoolmates. Nobody ever seemed to have heard of it, which made it all the better because they weren't expecting it. 2. A wire coat hanger. 4. A large coat button. 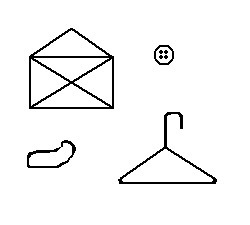 The first thing to do is to cut the hook end of the coat hanger off, as shown in step 1 over on the right. The easiest way to do it is to use a pair of snips or dykes (cutting pliers), but if you must you can just bend the soft metal of the hanger hook back and forth until it breaks. Be careful, the edges might be sharp! Next, thread the rubber band through the button holes as shown in step 2. The only fiddly bit is the size of the button. Too small, and it won't spin right to make the noise, too big and you'll have the same problem. Look through mom's button box and find a few to try. The ends of the rubber bands go over the ends of the wire hook. Then you just wind up the button until the rubber bands are twisted tight. If you let go of the button now, you'll see how it spins rapidly. Inside the envelope, the button will snap against the paper sides which creates the loud buzzing sound that startles people. Don't forget to write dire warnings on the outside of the envelope! Things like "Danger: Rattlesnake Eggs" and "Do Not Crush: Rattlesnake Eggs" are good. Skulls and Crossbones are always fashionable. To use, wind up the button and slip it inside the envelope. Hold the sides so the button doesn't move and give away the trick until you're ready. You can even peek inside yourself while holding the button. When everyone is looking inside, slightly open the envelope and let it buzz! Hello everyone. Stephen Macklin here. Most of the time I'm over here where the only real danger I pose is to the English language, and I occasionally pose a threat to rational thought. When Ted invited me to do "some peices about sailing, as well as anything else that might catch your fancy" I gave it serious thought for 1.3 seconds before agreeing. Then I thought, "how do I teach someone how to sail without, you know, a boat?" Basic principles? I can do that. Basic racing tactics? I can do that. How a boat feels under sail? That is challenge. The best way to learn to sail is on a boat. If you don't happen to have one, or have a friend with one, don't lose hope. If you want to sail you can. And in this post I'll tell you how you can learn to sail for free! There's not really that much to the secret. All you have to do is ask. If you live in an area where there are sailboats, there will more than likely be sail boat races. Now you might have had in mind something more genteel and relaxing than racing, but races are an easy way to get on a boat and learn how to sail. One common fact in local club racing is that there will almost always be at least one boat that needs an extra body, and an extra pair of hands. Races are probably held one or two evenings a week and at least one day of the weekend. Get yourself onto the dock and start asking if anyone needs crew. Getting onto the dock shouldn't be too difficult. Even if the race is being run out of the snooty local yacht club that restricts access. Chances are you won't be able to park on site so find a place a park and walk in. If they stop you at the gate tell them you're there to crew on (insert the name of any boat you happen to know or make one up.) If you look like you're on a crew, chances are the kid at the gate isn't going to send you away. A few things to keep in mind. Since you probably don't have a set of foul weather gear, don't go on a day when it might rain. They will still race, but you would be miserable. Sunglasses are key when you're on the water, spend a couple of bucks on a croakie. Murphy's first law of sailing is that the more expensive your sunglasses are the more likely they are to go overboard. A good cap is probably wise as well, but invest in a "lid latch." This is essentially a piece of string with a clip on either end. One end for the hat one end to your shirt. When you buy it, it will probably feel like it costs too much - but in the long run it's cheaper than replacing hats. Shoes matter. You're going to want to want a decent pair of shoes with non-skid and non marking soles. When someone is nice enough to have you on board, you don't want to pay them back with scuff marks all over the deck. Wear something that will stay on, and never wear sandals. There are lots of thing to bang your toes on on a boat. Keep in mind also that there is a better than average chance that your feet and shoes will get wet. Wear shoes that are comfortable without socks. Wet shoes are tolerable. Wet socks are never good. You should probably know some boat basics before you go. Little things like Port is left and Starboard is right. The sail at the front of the boat when you're sailing into the wind is called the Jib. The sail attached to the mast and the boom is called the Main. The unofficial reason the call the boom the boom, is because that's what you hear inside your head right after it hits you! When they are sailing downwind (with the wind behind the boat) they put up a big colorful sale called a Spinnaker. You may also hear it referred to as "the kite." Be honest about how much experience you do or don't have on boats. Sailors generally are open to bringing someone on board with no experience because they like to have names to add to their crew lists. If you are a complete novice, chances are your role on the boat during a race will be as ballast. Or in sailing terminology, Rail Meat. Your job will be to sit on the high side of the boat with your legs hanging over the side. When the boat tacks you move to the other side. You might be asked to help with some tasks like stuffing the spinnaker below when they take it down but not much more. This doesn't sound exciting, but it gives you the chance to observe and ask questions. There's a bit of etiquette to this mostly arising from common sense. Ask questions after things happen - and then settle down. After you've asked a few questions you will probably find that people will be explaining things to you before you ask. Remember, the people around you have an interest in developing new crew. There are a lot of races in a season and lots of opportunities for schedule conflicts. Developing new sailors is good for the team, and good for the sport. Be eager to learn and to help and you will be invited back. After you've got a couple of races under your belt ask to take the helm sailing to or from the race. Don't worry they'll keep and eye out to make sure you don't do anything too far wrong. Sailors will also help other sailors on the dock - if the boat you sailed with last week doesn't need help, they may know someone who does. Don't be afraid to freelance and sail with many different boats until you find a permanent spot. And if racing turns out not to be your thing, you still managed to learn how to sail without having to pay for lessons! Look for future posts on the basics of yacht racing - and other dangerous things. My son served a tour in the navy on the submarine USS Philadelphia. One night I got to wondering about the method the US uses to name its' subs. Here’s a little bit about what I found. Before WWII, all US subs were numbered by type, so you had the O-25, the R-14, and the S-12. Militarily efficient, but not very inspiring. In WWII, US submarines were named after fish and marine creatures. So we had cool scary names like the Barracuda, Stingray, and SeaDragon. We also had some less-than-fearsome names like the USS Plunger, the USS Tuna, and USS Cod. We had a lot of submarines in WWII, and I guess we ran out of good names. Since then, the Fast Attack boats have been named according to evolving custom, starting with the same fish and marine creatures, then moving on to Presidents, Admirals, and important Americans, for a while cities and towns, and most recently to States (which used to be what we named Battleships for). For the ‘boomers’ (missile boats), the evolution was from Presidents, to Distinguished Americans, and now States of the Union. There was a time when you knew a ship’s function by it’s name; the Iowa and Texas were battleships, the Helena and Indianapolis were cruisers. It's not that cut and dried anymore. While poking around, I saw among the USN Ballistic Missile Submarine force the Lafayette (SSBN 616), Tecumseh (SSBN 628), Von Steuben (SSBN 632), Casimir Pulaski (SSBN 633), Simon Bolivar (SSBN 641), and the Mariano G. Vallejo (SSBN 658). There is also a Fast Attack boat named the Kamehameha (SSN 642). Not all of these boats are still in service, the average lifespan of US submarines appears to be around 30 years. The names may be familiar to you, in a vague sort of way. But what did these people do that was important enough for the navy to name ships (er, boats*) after them? Click on the names for more complete biographies. The Marquis de Lafayette was a French soldier and statesman who played an important part in the American Revolutionary War. One of the great leaders of the American Indian tribes. A member of the Shawnee, he worked to unite the Indian nations against the encroaching white man. Friedrich Wilhelm Augustus von Steuben was a Prussian soldier who came to America to help in the war against Britain. He was instrumental in turning Washington’s ragtag band of revolutionaries into an army, introducing techniques of training that are still used today. Polish officer who is known as the Father of American Cavalry, he helped organize and train troops for General Washington. He trained the father of Robert E. Lee in Cavalry tactics. This one has me a little stumped. Basically his claims to fame – as far as the US Navy is concerned – are that he traveled through the US soon after the war of independence, which may have inspired him to liberate South America. He is sometimes called the ‘George Washington of South America’. I’ll keep looking for the tie-in, unless ‘prominent Americans’ extends to the whole of the Americas (USS Carmen Miranda anyone?). Born in Mexico, he considered himself a Californian above all else. He played an important part in the development of the California territory and it’s eventual inclusion into the United States. A dynasty of Hawaiian monarchs. I always thought it was just one King. I would guess that the submarine is named after the first Kamehameha, who was known as "the Great". I’ll be looking up some of the other, less well-known historical figures later and I’ll link to their biographies as well. * In the US Navy, all large surface vessels are referred to as ships but all submarines are called boats. I like thinking about the world before electronics. Not that I'd like to return to those days, but the machines invented to perform tasks in the world of mechanics are sheer brilliance. Probably topping the list of really cool mechanical machines is the machine known as Archimedes Screw. 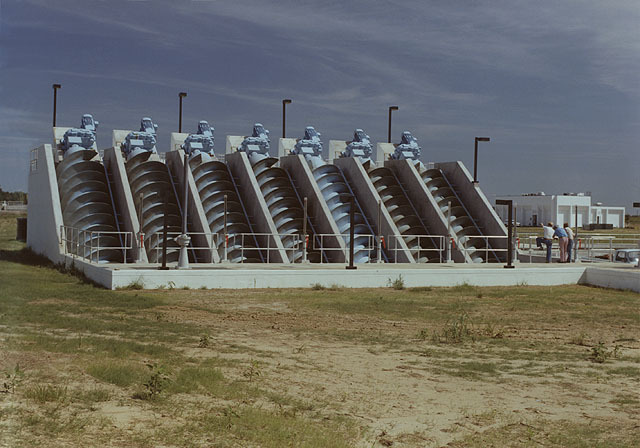 Archimedes Screw enables water to be drawn up hill (or to irrigate some Hanging Gardens that might be hanging around the city of Babylon). How does it work? Well, you turn the screw and the water flows up the screw. The simple machines that you learned about in elementary school? Well, here is where they matter. The screw is an inclined plane wrapped around a cylinder. As the screw turns, it scoops up water. This water is pushed up the incline (around the cylinder) until it finally pours out from the top, feeding an irrigation system. 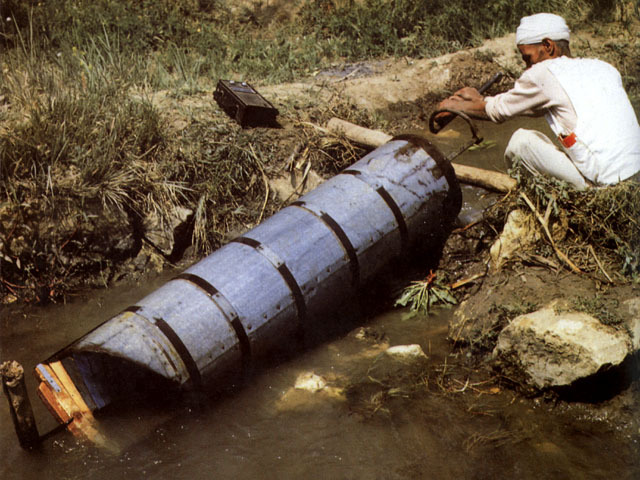 For more on Archimedes Screw (and his other wonderful inventions), check this out. You've probably heard about the recent voting for the "new 7 wonders." The expressed aim of the project was to call attention to world heritage and I hope that it does this. We all have an interest in preserving the heritage of the world. It is important to note, however, the difference between these wonders and the canonical Seven Wonders of the Ancient World. The Wonders of the Ancient World are initially due to Herodotus. He compiled his list of places he saw as he traveled around the Mediterranean. Destroyed with the Library of Alexandria, Callimachus of Cyrene compiled a collection of "Wonders around the World." They probably weren't finalized in what the wonders are now known as. It wasn't until the Middle Ages when the canon of the wonders were drawn to what it is known as now (they weren't, as the press releases of "The New 7 Wonders" suggest, decided by one man). I've traveled a decent amount and been to a lot of different places in the world. However, I have only been to one of the so-called "New 7 Wonders." In all honesty, two of them I don't think belong on the list at all. I find it interesting that none of them is built in modern times. I wonder about that - do we build physical wonders anymore (as a culture)? The same website has a list of seven modern wonders and seven forgotten modern wonders. I've seen seven of those fourteen and I just don't feel like those really rise to the level of wonder. What do you think? Any thoughts on what modern wonder you think will make it to the canon and be discussed 2000 years from now? If you want to figure out how tall something is (like a house or tree), or how high it goes (like a rocket or balloon), there’s a simple and inexpensive way to get a fair estimate. You’ll need a couple things for this, but they’re easy to find and you probably already have them around the house. Find a protractor and a rectangular piece of cardboard bigger than the protractor. You’ll also need a push pin, some string and a weight of some kind (I used a fishing sinker). First, let’s make a simple theodolite, which is a tool used to measure vertical angles. Take the cardboard and using the push pin, fasten the protractor to it so that the flat edge of the protractor runs along the top of the cardboard. Tie the weight to one end of the string and the other end to the pin. 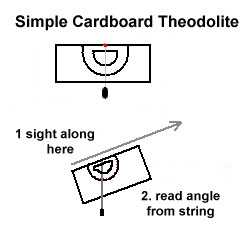 This way, when you tilt the cardboard you can read the angle by seeing where the string hangs past the protractor. The other thing you’ll need is a tangent table, which can be found in any trigonometry textbook. That’s right, you’re using trigonometry for this! Use the one below, or find one to your liking, they're all the same (click it and it gets bigger). Take the theodolite and stand a known distance from what you’re trying to measure. In the diagram, it's where the black and blue lines meet. This distance is the baseline, and the farther the better (as long as you can see the top of the thing you’re measuring). For instance, say you’re going to measure the altitude of a model rocket, and you’re launching from a football field. The tracker is on one goal line, 300 feet (100 yards) away from the launch pad on the other goal line. When the rocket launches, the tracker follows the rocket with the theodolite until the rocket reaches apogee (it's highest point). The angle is read (where the string marks it on the protractor), and this angle is written down. Time for some simple math. The formula is on the diagram. Look up the tangent for the angle on the table, multiply that number by the baseline, and that is the altitude in feet. Simple!!! 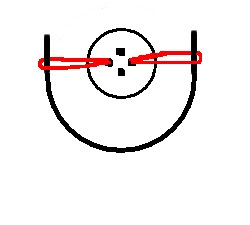 An example: baseline is 300 feet and your measured angle is 40 degrees. The tangent for 40 degrees is .839, so 300 * .839 = 251.7 feet. This technique works great for things that stand still or go straight up, but the measurement will be off if there’s any horizontal movement. 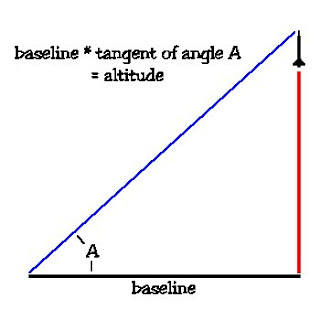 Using our model rocket example again, if the rocket curves towards you on the way up, then your measured angle will increase and the calculated altitude will be too high. One way to compensate for this is to have two people with theodolites standing at 90 degrees from each other (imagine a rocket launching from home plate on a baseball diamond and trackers standing on first and third bases). You can average their measurements and get a pretty good estimate of the correct height. You can also make a sturdier theodolite by replacing the cardboard with a length of wood or broomstick. Screw the protractor into the side of the wood, hold the theodolite like a rifle and sight along the length of it to get your measurement. You can drive a couple of finishing nails into the top of the wood to help with your sighting if you want, but it's not strictly necessary. So, how high is the tallest tree in your neighborhood?